installing, and maintaining high quality concrete patios. We Bring Your Dream Concrete Patio To Life. See our services listed below! Are you looking for something a bit more unique, personalized, and visually appealing for your concrete patio? Then we recommend hiring us to install a stamped concrete patio. These patios have all the durability of a solid piece of concrete because that’s exactly what it is. But we then stamp the surface before it fully sets so that it has patterns and unique designs. We can make the concrete look like bricks, tiles, octagon pieces, and more. A concrete stamped patio can be customized to fit your individual aesthetic or use one of our pre-designed patterns for precise stamping. With how diverse and affordable this process is there’s no surprise that when it comes to a patio, stamped concrete is one of the most popular ways to go! It’s not uncommon that we receive a client who already has a concrete patio but now needs a bigger one. This can be because you got a new piece of patio furniture, you’re doing renovations before selling your home, or any other number of reasons. Whatever the reason, we handle extended concrete patios with expert knowledge and hands-on practice, so you know you’ve put your patio in good hands. We can either make an extended patio with concrete or even extend concrete patio with pavers to add some extra flair and diversity. We have years of experience in how to extend concrete patio designs so there’s no surface or area too difficult for us to work with. Or, at least, not that we’ve seen yet! 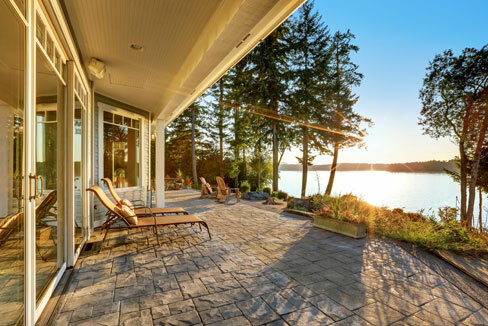 One of the latest trends is to have a concrete patio that is even with the surface around it. It’s visually appealing, but it has its downsides. It is more prone to flooding if there is a heavy rain period, especially where heavy rains are not normal. It also gets covered in dirt and weeds quicker as dirt is accidentally pushed on it and plants creep over. That’s why we love installing a raised concrete patio. It is raised above the rest of the area around it, so it’s less likely to flood or get attacked by pesky weeds. It’s also very sturdy since it is made out of concrete. We can also design a raised stamped concrete patio, combining the best of both a raised patio and stamped concrete into one. 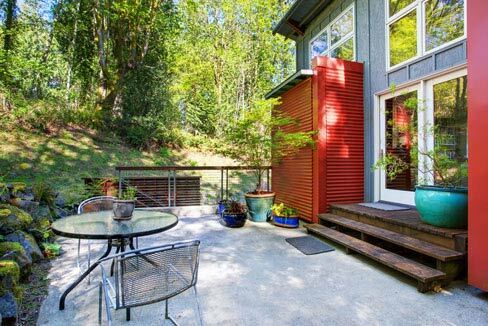 It’s a durable patio option that is also visually appealing so friends and family alike will admire your backyard paradise while you enjoy the company. If you’re looking for more ways to make your concrete patio a work of art, then turn your attention to a stained concrete patio. We use a variety of different stains to add beautiful and vibrant colors to any concrete surface. And it can be done in conjunction with other processes like concrete stamping. A stained patio is generally done in one of two different methods. We can use either an acid based stain that reacts chemically with the patio composition and creates natural, earthy tones. If you want more unique colors, then we use a water-based stain that can be mixed with multiple different hues before being applied. A stained concrete patio is a perfect way to make a visual statement while still having a durable and practical patio option. So call today to ask about a stained patio and if it’s right for you! Another patio material that we highly recommend is patio pavers. 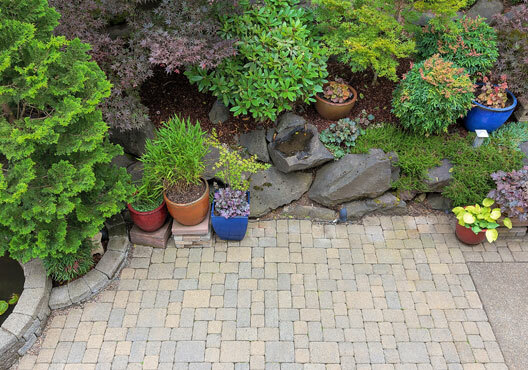 They are slightly more expensive than poured concrete, but a paver patio makes up for it in the ease of repairs. 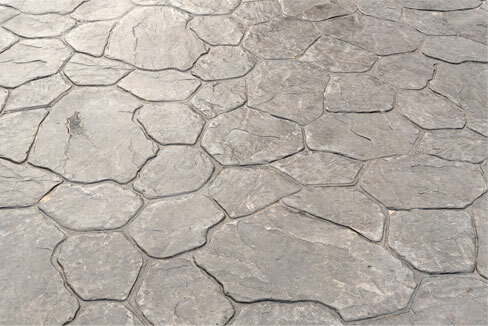 Pavers are individual pieces of a strong and durable material that are laid out and pieced together. This is important because it means that when there is damage to a paver, it can be individually removed and replaced. When a solid concrete patio cracks, it’s much harder to repair. 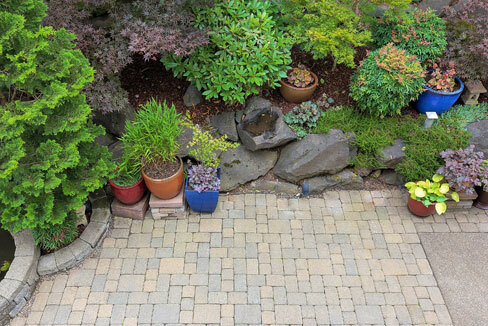 The other benefit of patio pavers is they can come in a wide variety of colors, textures, shapes, sizes, and more. One popular design is a brick paver patio. The pavers look just like brick and create a simple, yet cozy design. We can use pavers to create almost any patio you can imagine, so don’t limit your ideas. Ask your assigned technician what we can do and we’ll get to work right away. 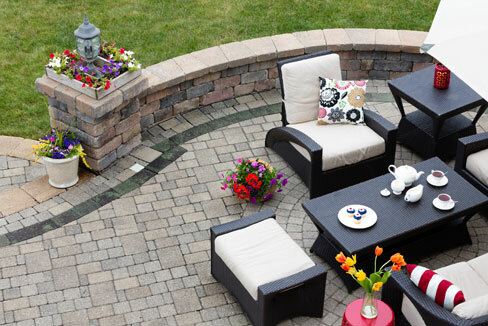 You just have to sit back, relax, and wait to enjoy your brand new paver patio in no time. If concrete or pavers do not fit what you’re dreaming of when it comes to a patio, never fear. We have a wide selection of options and one we recommend is stones. A stone patio creates a look that fits with any garden design, creating an earthy and natural looking patio that doesn’t clash with the natural outdoors. Laying stone patios is one of our specialty and our technicians have hands-on experience laying an outdoor stone patio of different shapes and sizes. So no patio is too difficult for us, no matter how big or small. And since stones themselves can come in different colors, textures, and shapes, we work one on one with you to decide what works best for your vision and needs. We don’t stop until we’ve met your expectations. And we’re not happy until we’ve exceeded them. Don’t trust your patio to just anyone, trust it only to the best. And if you’re in Las Vegas, that’s with us! We have been installing and improving concrete patios for several years which gives us the knowledge and experience to create some of the most gorgeous patios in Las Vegas. You can expect only the best when you call us to help with all your concrete patio needs. We hire only the best in the business so you never have to worry about receiving a sub-par patio. We create works of art for you to enjoy the sunshine outside. Because our customers deserve nothing less. A concrete patio can be anything you want it to be. It can be anything from a simple piece of concrete to a patterned concrete made just for you. It doesn’t matter how great your patio looks if it falls apart during the first bad weather summer. That’s why you can expect our technicians to use only the highest quality materials to build, maintain, and repair your concrete patio. We build patios that last. Because that’s the way it should be. We hire technicians that are highly experienced in the field of concrete, stone, and paver patios. From concrete resurfacing to new concrete pouring, we have a team with decades of experience ready to help! Call today and see why are the top-rated concrete company in the Las Vegas area. We feel that everyone should be able to enjoy the feeling of relaxing on the patio on a beautiful day. So we make it our mission to create stunning and durable patios at a fraction of the cost of some of our competitors. 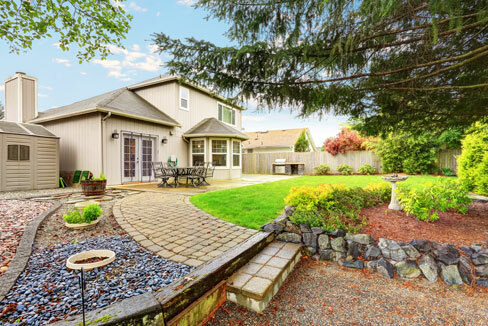 So you get the patio you dream of with a price tag you can handle. A concrete patio can be anything you want it to be. It can be anything from a simple piece of concrete to a patterned concrete made just for you. Our knowledgeable staff works one on one with you to design the concrete patio of your dreams. And, more importantly, we do it without breaking the bank. We won’t charge you an arm and a leg to have a reliable, beautiful concrete patio. So let your imagination run wild because the sky is the limit here! Another benefit of choosing Concrete Patio Las Vegas is you’ll have an expert staff of technicians working hard for you. Las Vegas residents agree that there’s no one better to take care of the job quickly, efficiently, and correctly. And we do it all with a smile, as being friendly is just a part of what we do. You’re more than just a customer to us. You’re a part of our service family. We will assess your driveway to help you understand whether it can be repaired or resurfaced — or if it’s time to repave. No driveway is going to last forever. Even the best driveways gets an average of 20 – 25 years of life before they start to develop major issues. Once it does get to that point, it’s pretty unlikely the driveway can be fixed with simple repairs and usually needs to be resurfaced. Not sure if repaving is the right choice?